As our schedule is dictated by the arrival of our little Penguin friends at dusk each evening, our timing has to fit around theirs! As our focus is on nature we don't get distracted by other 'attractions' so our tours leave a little later, we avoid the more tourist orientated venues, giving you more time to enjoy Melbourne in the morning, we pick up from all locations within the central Melbourne business district and St. Paul's Cathedral if arriving from out of town - opposite Federation Square. That way you don't have to rush back to your hotel just to meet us if you prefer. Journey through the fast growing South East region of Melbourne as we point out interesting facts about the development of ‘the most liveable city in the world’ as awarded for the sixth year running in 2017. EXCLUSIVE! Arriving at Phillip Island, we begin our exploration with an extensive tour of a free range nature park where you can get close with a huge variety (more than 60 in fact!) of our native friends over 100 acres including hand-feeding Kangaroos, Emus, Wallabies and Wombats. Our Cockatoo friend might even welcome you with a 'Hello". And of course, Koalas amongst many others. This is a fabulous free-range experience that focuses on the animals. We are the only operator that visits this family owned park. It’s then off along the rugged surf coast of the island as we travel to the Nobbies viewing centre – here you can look out onto ‘Seal Island’ – home to the largest colony of Australian Fur Seals. We will go Penguin spotting here before the parade as some remain in their burrows overnight. We then go wallaby and birds of prey spotting as we slowly make our way to the world famous Penguin Parade. There is plenty of time to enjoy the Penguin Information centre before we guide you to the best viewing spots for the nightly parade– cushions and warm blankets/jackets are provided complimentary for your comfort. Note: Above ground and also separate below ground viewing area - limited to 300 guests. 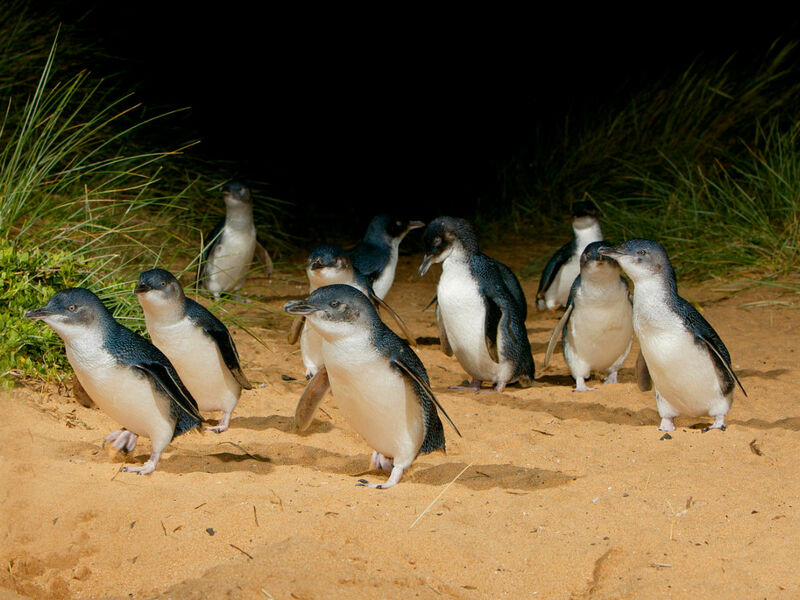 Situated next to the main path of penguins Penguins Plus offers fantastic up close viewing of penguins. Rangers are on hand throughout the night to answer your questions and give a talk 30 minutes prior to the estimated penguin arrival time. Spectacular penguin viewing with your own ranger in the Skybox - an elevated room with views across the Penguin Parade beach (as shown in the centre of the main viewing area). Participate in the nightly penguin count with the head ranger and enjoy a cheese platter and drink as part of your VIP tour experience. See out the evening in the Penguins Plus viewing area with up-close views of the penguins. Participants must be 16 years or over. Limited to 10 people. tour is approximately two hours. Take a guided ranger tour through the penguin colony before settling into your reserved front row seats in a dedicated viewing area for the parade. Watch the penguins emerge from the water and make their march across the beach, then continue the journey along the Penguins Plus platform. Each guest supplied with binoculars, a thermal seating mat and a headset for the ranger commentary. Tour groups limited to 10 people each. Limited to ages 12+. PLEASE NOTE: All options will be reconfirmed for availability with the Penguin Parade before any payments are processed. Children are 12 and under. Infants under 4 years old.